L'Enfer du Nord or Hell of the North is the nickname of the toughest and most prestigious classic race. After the surprises of the past weeks it's hard to predict the winner of this 117th Paris-Roubaix. Since 1968 the start is in Compiègne. There are some changes in the first part of the race, but the final remains the same. 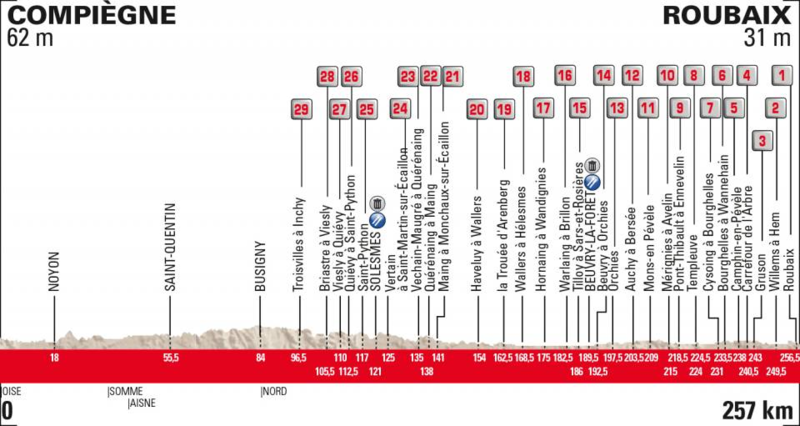 Twenty-nine cobbled sections will separate the men from the boys. Most feared are Trouée d' Arenberg & Wallers, Mons-en-Pévèle and Carrefour de l'Arbre. After all the suffering on cobblestones the riders will finish on the smooth surface of the Roubaix velodrome, where the spectators can witness the lap of honour of a triumphant soloist or the tantalizing sprint of an elite group. Forecasts say cloudy, no rain (~10% chance of rain). And no rain in preceding days? Cobbles will be dry? Rain all day Tuesday, but that's it, so they'll be dry unless that changes. Son of Amsterhammer wrote: Is Kristoff racing? According to Ventusky, the weather models say it could even snow on saturday! Subject to change, of course, but I find Ventusky pretty reliable, been using it for months and usually the forecast is pretty reliable, more 2 or 3 days before. Please stop talking about the weather. It will be dry again. End of discussion. And who are the favorites here? Van Avermaet, Van Aert, Naesen, Kristoff, Degenkolb, Politt? Anyone who knows anything about what happened to Stybar yesterday? Is he past peak form, or could he be a contender here? OlavEH wrote: And who are the favorites here? Van Avermaet, Van Aert, Naesen, Kristoff, Degenkolb, Politt? There is also a Slovakian of which you may have heard. Defending champion, triple world champ, that kind of fella. He said for the Czech press that he had the same virus and stomach issues as Gilbert couple of days before Flanders because he lived with him in the same hotel room. But he also said that he felt OK before the race. It's really hard to pick favorites this time. Sagan has disappointed in Flanders, but on a flat course he still has a chance. DQSt doesn't look as strong as two weeks ago, but it still has three potential winners. Kristoff ends up on top of my list, but he has never finished higher than ninth. Degenkolb seems to be back, but is he good enough to aim for a win? Vanmarcke did surprisingly well with his knee, but does that make him a contender for P-R? Last edited by Pantani_lives on 08 Apr 2019 17:33, edited 2 times in total. I think Politt must be close to being one of the outright favourites now, not just a dark horse. 6th in E3, 5th in RVV, 7th in PR last year. He looks the real deal now, and has a handy sprint as well if it comes down to it. Yes, I'm also really curious as to how strong Politt will be here this year. It definitely suits him better than the Bergs and his sprint after a long, hard race seems to be quite something. I was actually expecting Rowe to have a really strong campaign but he was just okayish in de Ronde, though this will suit him better. Other than that it'll probably the usual suspects with one or two dark horses coming from the early break. Pantani_lives wrote: It's really hard to pick favorites this time. Sagan has disappointed in Flanders, but on a flat course he still has a chance. DQSt doesn't look as strong as two weeks ago, but it still has three potential winners. Kristoff ends up on top of my list, but he has never finished higher than ninth. Degenkolb seems to be back, but is he good enough to aim for a win? Vanmarcke did surprisingly well with his knee, but does that make him a contender for P-R? Pity Bettiol isn't riding, the way he rode yesterday, i'd say he would have a decent chance in Roubaix as well. Asgreen to take his place? Vanmarcke actually surprised me yesterday. He was pretty strong, and without the climbs, who knows. Could it be his year, when nobody is looking his way?